D&L Wood Products does architectural millwork for high-end commercial properties across the U.S. These quartered, figured eucalyptus wall panels are finished with a high-gloss polyester topcoat. These wavy wall panels fabricated by D&L Woodworks were a highlight of this millwork package for a high-end building located on Lake Shore Drive in Chicago. 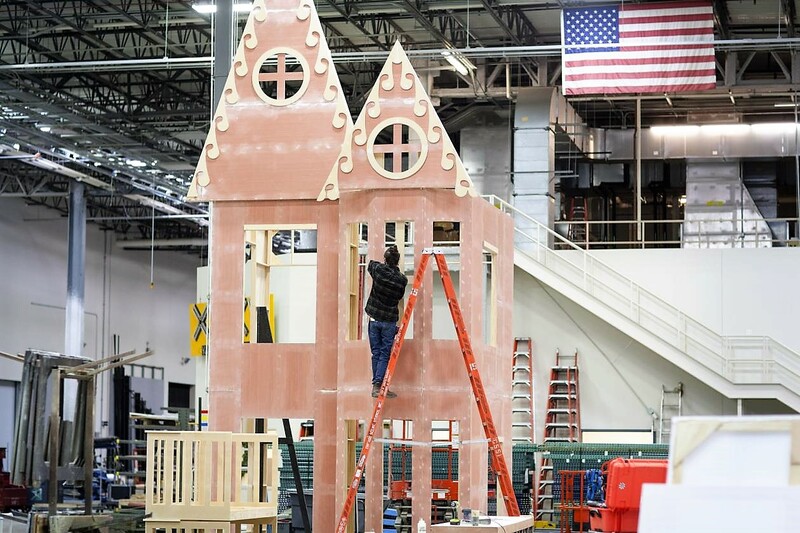 Known for its high-end, museum quality architectural millwork projects, D&L Wood Products can trace its humble beginnings back to 1992, a tool box and a one-car garage. Bob Ligna, president, says that initially he was just a small contractor who did some remodeling. However, certain jobs would require millwork, which often sent him to local lumberyards in search of those special pieces. But frequently he would have to wait two to three weeks for those components, so he decided to start making the millwork himself. With each subsequent project and with millwork increasingly involved in each one, Ligna says he decided to get out of contracting altogether and work on architectural millwork jobs full time. “We were still pretty small then with just two people – me and one other person,” he shares. Initially they were getting hotel remodels here and there, which eventually led the small company into the hospitality remodeling end of the business. “I did my first millwork lobby in South Bend, IN, for Springhill Suites,” he says. By today’s D&L Wood Product’s standard that was a small job, but it was huge for the company at the time, Ligna says. D&L Wood Products has approximately 37 employees at its 30,000-square-foot Indianapolis plant and has installed custom architectural millwork for commercial properties and hotel chains like J.M. Marriott across the country. All millwork is fabricated and finished at their plant and then shipped to the job site. “But we take control over the installation,” Ligna adds. 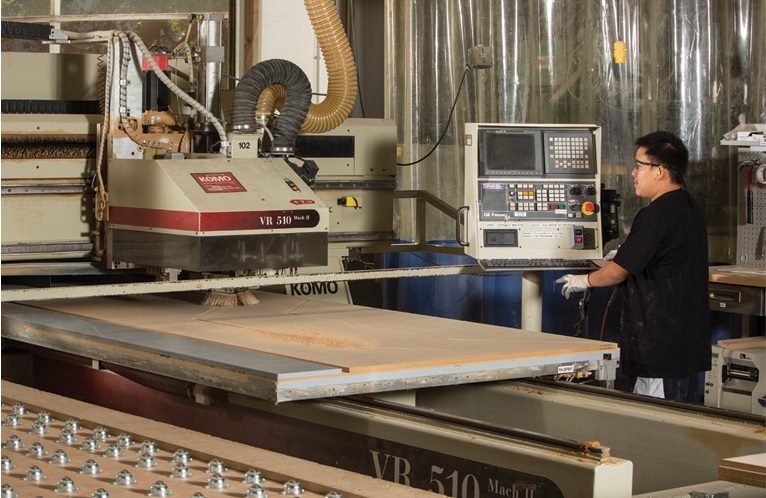 D&L Wood Products has been fortunate over the years in that it has never been without work – even during the lean years of the Great Recession, which took a heavy toll on many custom woodworkers. Ligna credits his success to a lot of things including hard work as well as the company’s background in hotel remodels. Ligna says that a remodel is completely different in concept than working on a new hotel. Since it involves understanding the costs of shutting down an entire hotel floor to do the work and getting the product and personnel in and out quickly to prevent loss of revenue. In the hospitality industry, niche and boutique hotels are becoming more prevalent. As a result, the architectural millwork needed for these projects is becoming less traditional, Ligna says, with a more contemporary and modern design. “Oak is not used as much,” he notes. Solid surfaces are being specified by architects more and more, and the overall spaces, including the lobby areas and guest rooms, are trending to a more sparing, minimalist look. As veneers and substrates have risen in quality and availability, the capability to do more unique interior designs has increased as well. One example is D&L Wood Products’ award-winning “500 Lake Shore Drive,” which won the Architectural Woodwork Institute’s (AWI) Award of Excellence and an honorable mention in the 2013 Custom Woodworking Business Design Portfolio Awards. One highlight of this project was the curvy wall panels. Quartered, figured eucalyptus wall panels finished with a high-gloss polyester topcoat adorned the lobby and were arranged in a unique customized pattern. Quartered elm was used for the two elliptical-shaped rooms in the amenities area and were pre-formed and attached with no visible fasteners. The game room utilized antique, salvaged barn siding and was mitered at every outside corner which provided a unique profile. Another type of material used was quartered walnut at the wavy wall, which consisted of undulating ribbons of walnut for an eye-pleasing final design. A full-scale model of the business center curved wall enclosure was fabricated in D&L Wood Products’ shop to determine the proper, radius, fabrication and installation methods. Floor templates were then taken to the project site so that the layout could be coordinated with the drywall contractor. Paneling was custom formed in a vacuum press to the exact radius of the wall that was being framed in the field. Each panel was then installed in the 1/3 rotating pattern from the inside of the wall so that no fasteners are visible. The walnut wavy wall was designed in sections that were able to stack upon one another and be installed from behind the wall so as not to expose any fasteners. Ligna credits his estimation department as well as engineering department and wood shop personnel on the company’s success. Estimating bids correctly is extremely important especially on complex designs and jobs like the “500 Lake Shore Drive” project, he says. D&L’s shop contains a variety of woodworking machinery including: Weeke Vantech 510 DB CNC machine, Brandt edgebander - Ambition 1110F, Weeke drill and dowel machine - BHX 050 and a VacuPress Industrial High-Flow D10HF120226 vacuum press. Also, each bench operator has his own dust collection system to ensure a clean shop, Ligna says.